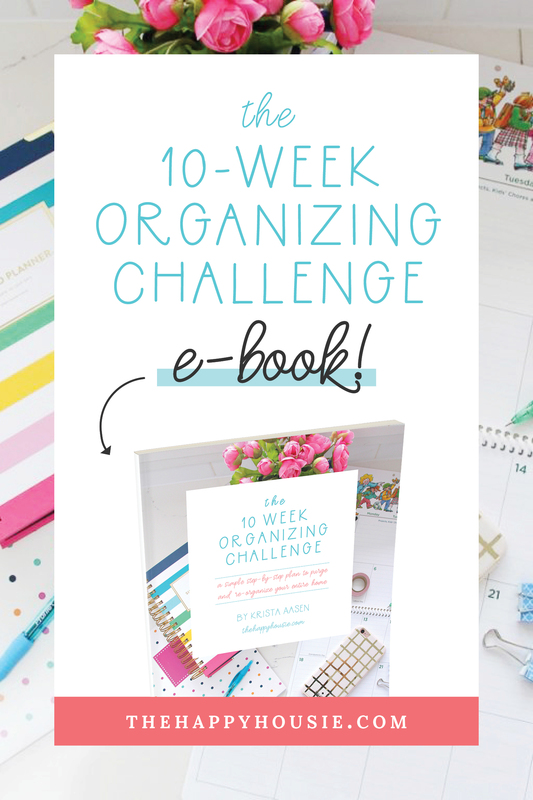 Are you in full-on organizing mode these days? Does the onset of January inspire you to make changes and simplify your life? Maybe it is something about cleaning up and purging after all the busyness and excess of the holiday season. It’s like putting your house on a diet. Getting rid of the excess and clutter and getting it all put away neatly. Restoring a little calm and function to your life. Which is exactly what a functional Command Center is all about. We have a little closet off our entry hall that most people would use as a coat closet. But as a family we enter our house through the garage and use our mud room / laundry room to hang our coats, rendering the coat closet a waste of space. So we decided to convert it into a Command Central Station. The closet started out looking like this…though you can see we already added the countertop in this image. 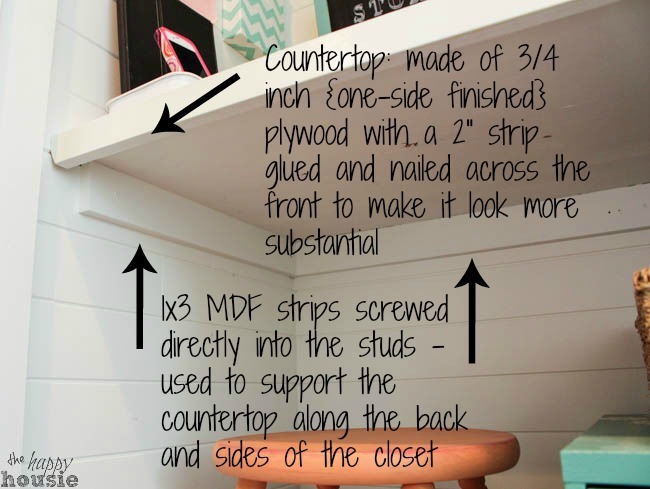 Originally there was no countertop; it was just a wide open closet with one wire shelf at the top. You can tell we were using the space really effectively before. Step one: it had to be pretty. Of course. 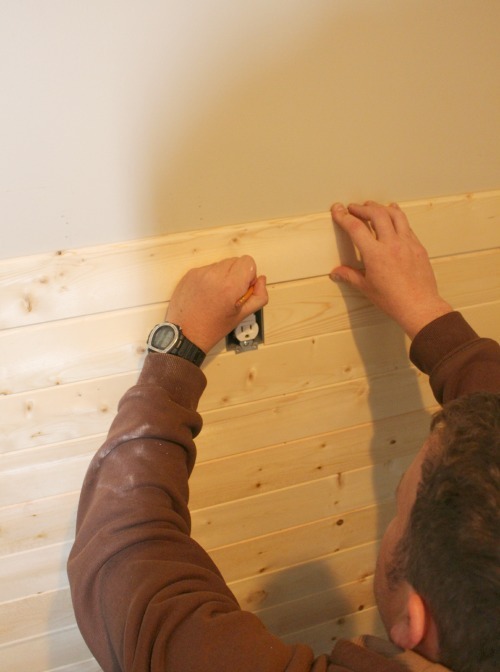 So we added some tongue and groove paneling to the inside walls of the closet. Once the hubs installed it and filled the knots and holes, I went ahead and primed and painted it in two coats of Cloud White (the trim colour that we have throughout our house). I also painted out the shelf/countertop in Cloud White, though I also top coated it with a coat of clear varathane to give some extra endurance. I must admit that the varathane did cause it to yellow very, very slightly which I am not thrilled about. In the images below you can see the way that we “hung” the shelf/countertop. Then came time for the fun part. 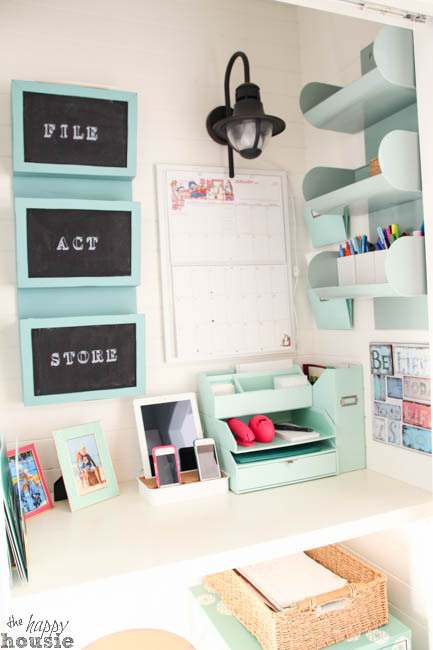 1) A drop zone for kid’s homework and paperwork, mail, bills, receipts, and reminders. 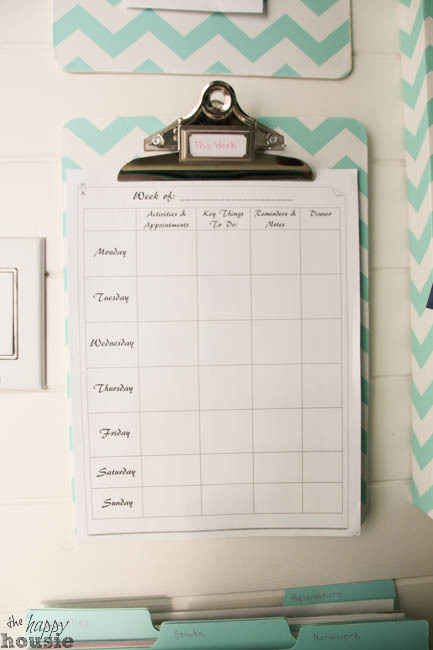 2) A space for our calendar – both the monthly calendar and a weekly agenda. 3) A magnet board for cards, reminders, photos etc. 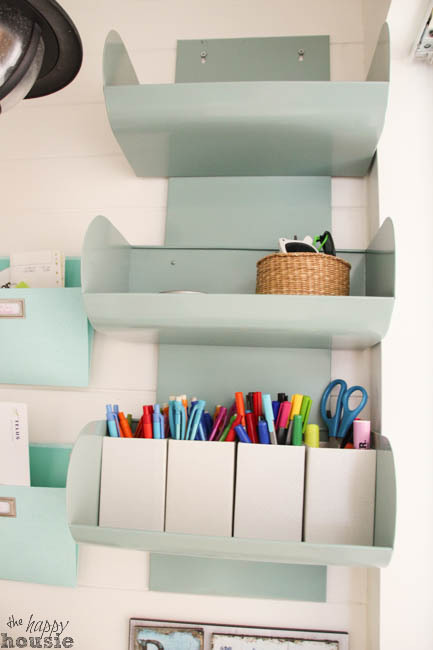 4) Storage space for our office supplies, envelopes and stamps, pens and pencils etc. 5) A spot for charging up our technological devices. 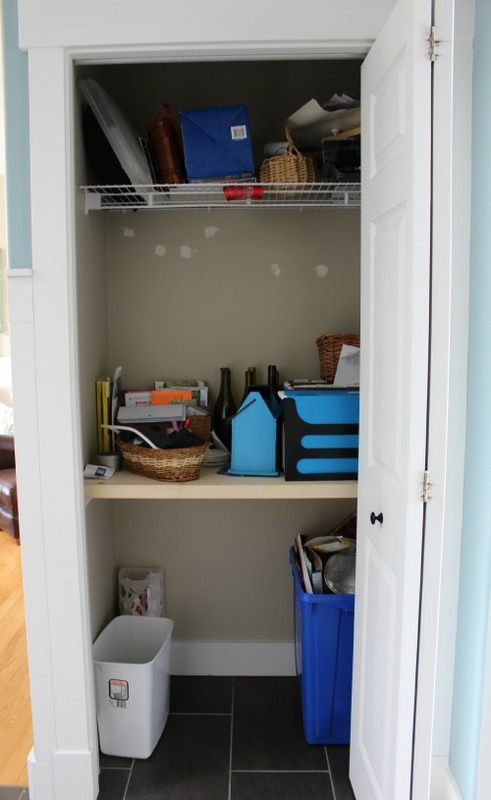 6) A place to sort and file all the “stuff” that comes into our home on a daily basis. As papers come in, they can be BRIEFLY placed on the countertop. I try to deal with paperwork on a daily basis and decide whether it needs to go into FILE, ACT, or STORE bins. FILE and ACT are pretty obvious- they are for papers that we either need to file or act upon/deal with. My hubs usually goes in and files away everything in the FILE bin every month. The key to the ACT bin is to make sure that you make note of what you need to do. If it is something that requires immediate attention, then we place it on one of the clip boards to the left of the bins. 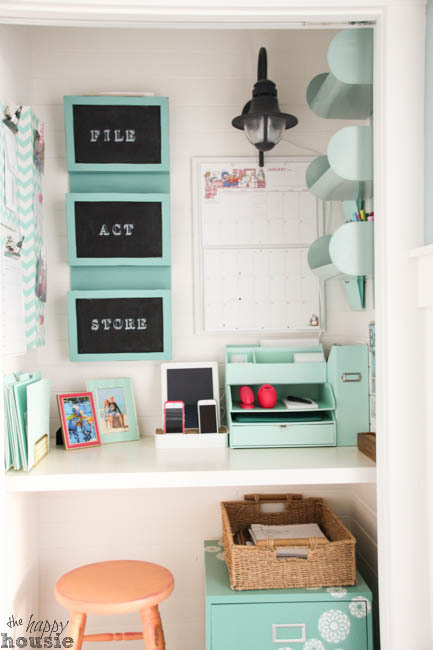 The STORE bin is designed to keep the Command Center ‘clutter free’ – meaning that sometimes you just have papers that you need to hang onto for a few days or weeks (activity catalogues, swimming report cards, etc.) so the STORE bin is the perfect out-of-the-way spot for herding all those types of papers. In addition to the large filing cabinet below the countertop, we also have a little spot for files that we use more often. You can see it just below the clipboards and magnet boards on the left hand side of the closet. Full Source Guide at the bottom of the post. So now is the part where I show you a ridiculous number of pictures… you know what they say a picture is worth a thousand words. Well, if so, this just became one really wordy post. I turned an outdoor light fixture into a sconce that operates on a switch (yes, I did the wiring!! )…and I will be back soon to share more details on how it went down. I love having a light in this space because there is no overhead light. The Command Center Closet lives directly beside the kitchen, just off the front entry, so it is the perfect central drop zone. I love how it means that we no longer clutter up our kitchen counters with paperwork and charging devices. Yay!! Quite the before and after, isn’t it? DIY Outdoor Light Fixture turned Sconce on a Switch – tutorial coming soon! 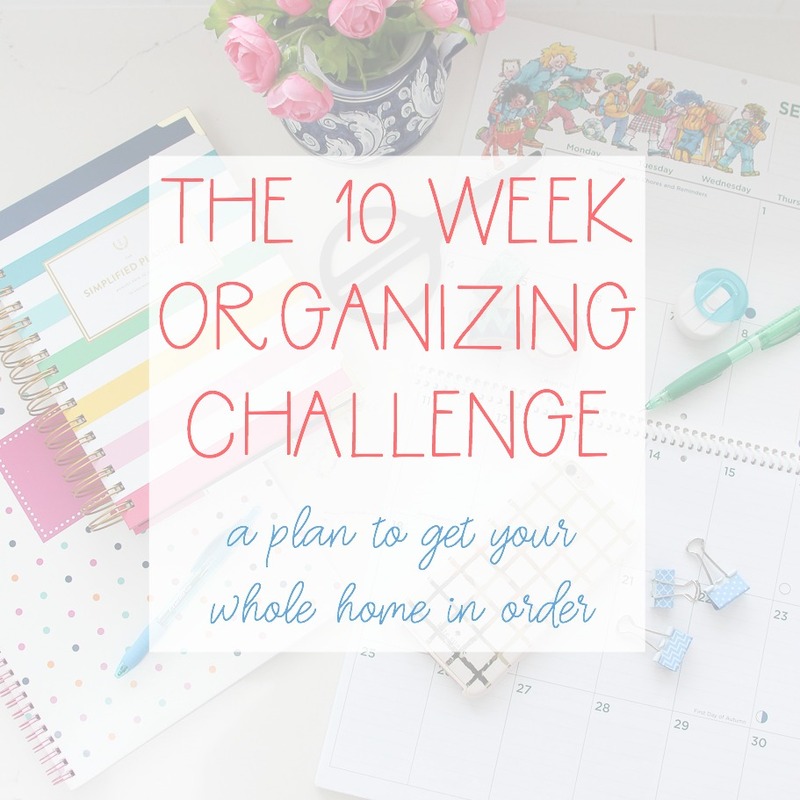 This week is all about organization! 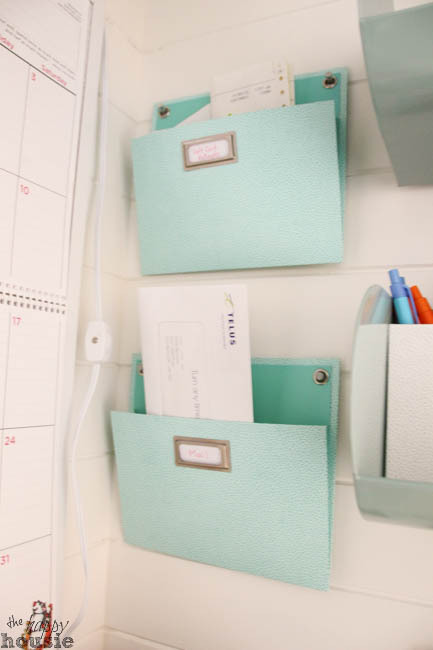 Sunday is the first DIY Challenge of the year… and getting ourselves organized is the name of the game. Here is what my cohosts have been up to for this challenge! 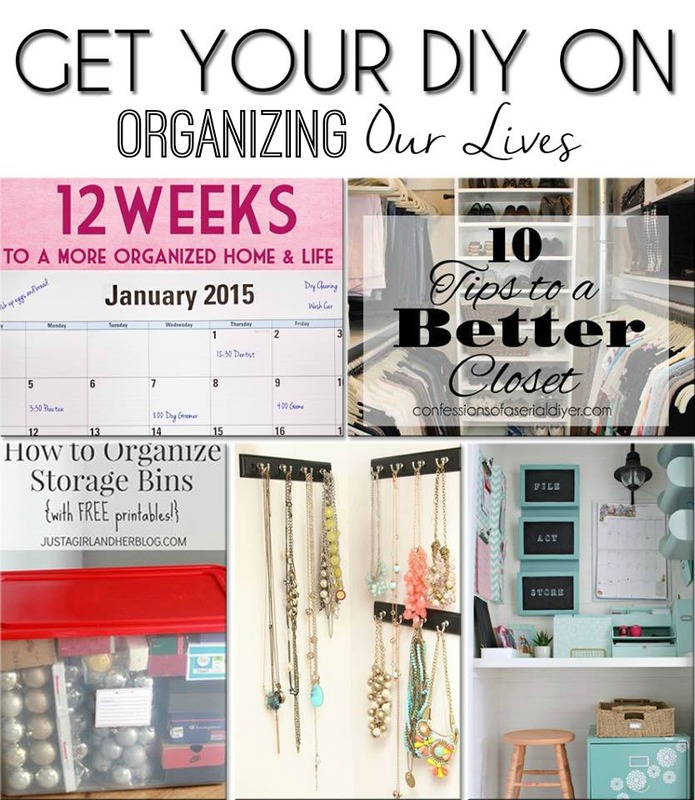 Hope to see you Sunday with your organizing projects and makeovers! I love everything about this!! 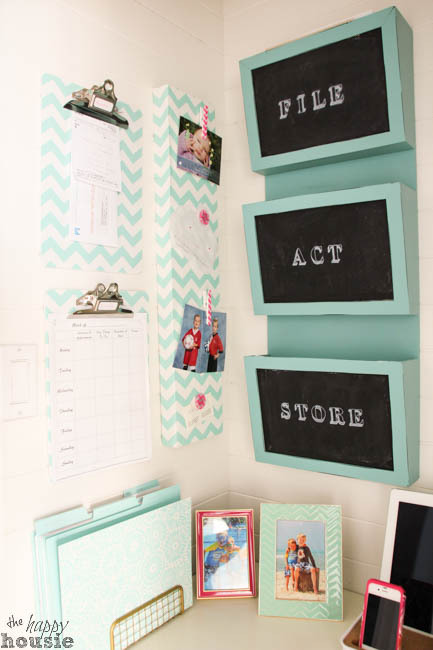 I have been staring at my desk area trying to figure out how to get it organized and I love your “File”, “Store” and “Act” bins as well as using the clipboard for immediate action stuff. So awesome. Plus, I can’t wait to hear how you turned the outdoor light fixture into one that works in the closet. It’s so cute! This is absolutely stunning! The only other place I’ve seen a command center so gorgeous is a Pottery Barn catalog. Thanks so much for sharing your amazing organization skills with us at Merry Monday this week! Wow! That is a fantastic compliment! Thank you so much – it is definitely one of our most used spots in the house!! Oh wow, this is gorgeous and seriously functional! I can’t believe your before and after. I didn’t know a little closet could be transformed like this. Love it! Thank you Laura! It is definitely one of the most used areas in our home!! I love this. Where is the “believe” artwork from? Never mind! Just saw the other comment about it! Thanks. I’m dying to have the Metal Storage shelves, but I’m here in the US and can’t get access to even purchase them online. Is there anywhere else I could look? Hi Krista, just wondering if you were going to be doing a tutorial on the DIY Outdoor Light Fixture turned Sconce on a Switch? I love this space btw, I’m hoping to accomplish something very similar, but I too need to install a light. Thanks! 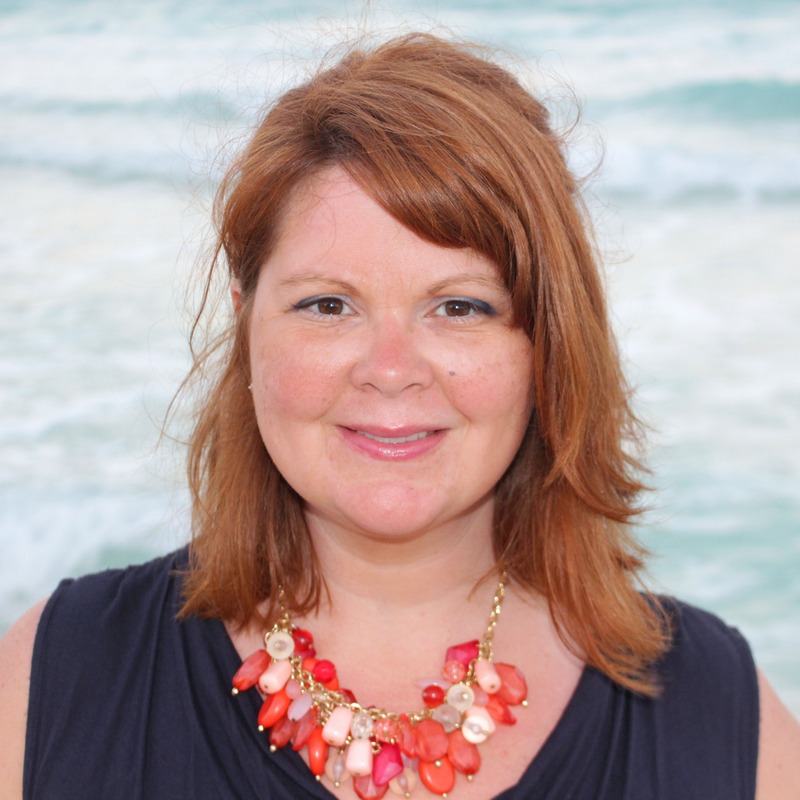 Hi Sandra – I did share a post on that! Here it is: DIY Hard-wired Turned Plug-In Fixture. Hope that helps!! 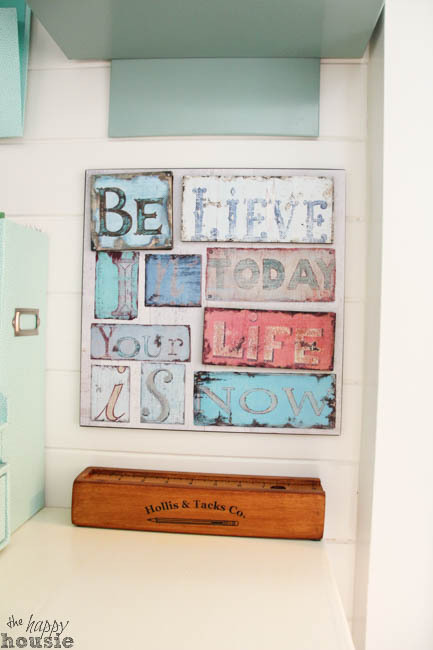 Where did you get the “Believe in Today” signage? Wow! Great job, especially adding the light. Really makes this space inviting and unique as well as functional. I have the opposite problem… no front coat closet. Haha. 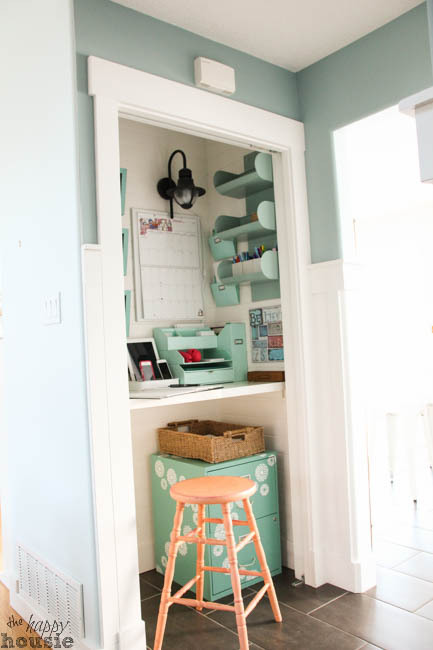 I might take some inspiration from this for another command center spot in the house. 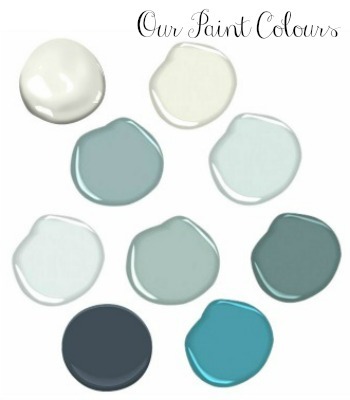 Love the colours you used too! I initially saw this in your other post about the light fixture. And then when I came here I realised it was in a closet. 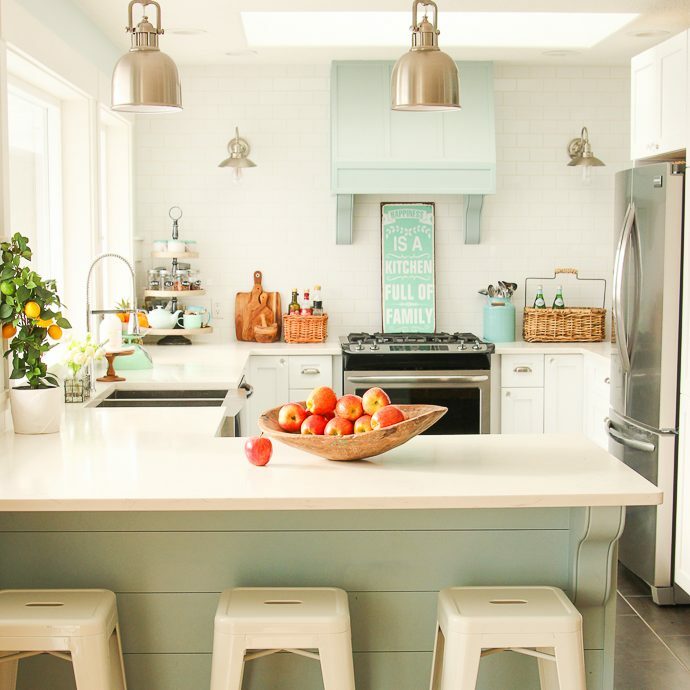 But you cannot tell, because it is so light and airy – so bright, fun and of course organized. This is a great job. Very well tho ught o ut and very creative! Kudos to you! Oh Krista!! It’s perfect!! I’ll be pinning this for reference when we tackle Gabrielle’s bedroom. I’d like to make her a work-space in her closet. Thanks Christine! I love how it turned out- we use it EVERY DAY!! This is REALLY well done. Thanks for the inspiration! This area is ADORABLE!! You always do such an amazing job with your projects. Good job! Thanks for such good explanations and photos! I also like to add personal decorative touches even if I’m the only one who will see them. You’ve created a really pretty space. Hi Melanie! I just checked and I don’t see it on the target website either. I bought it in store – I think it was only about $10. It was in the summer but they may still have them in store? It is metal (white painted) on the outside and then cork inside, with slots and openings for the cords and charging devices. Best of luck with your search! I’m so impressed! 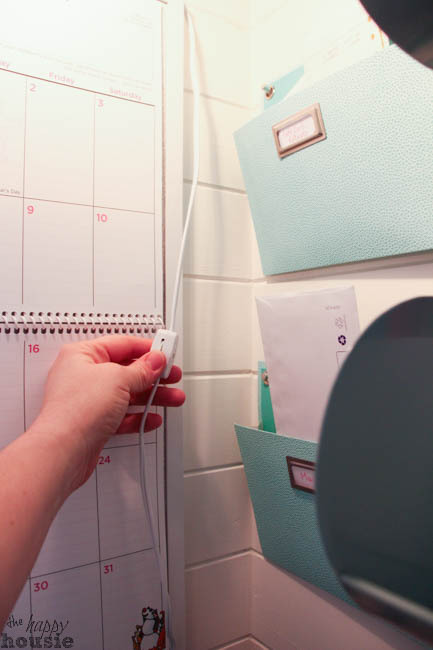 How handy that you had an outlet in your closet too! Always looking for ideas on managing the paper clutter that seems to reside in the kitchen. I’ll have to see about incorporating some of these ideas into our extra closet – which is the kids’ “backpack/school supply” closet right now. Great job Krista! The walls are a perfect touch!! I can’t wait to show this to my 10 year old daughter, she could save so much space in her room if we set up her closet this way. Thank you for the step by step tutorial (and for the link up). Your makeover is amazing! Wow Krista, what an excellent use of a small closet. 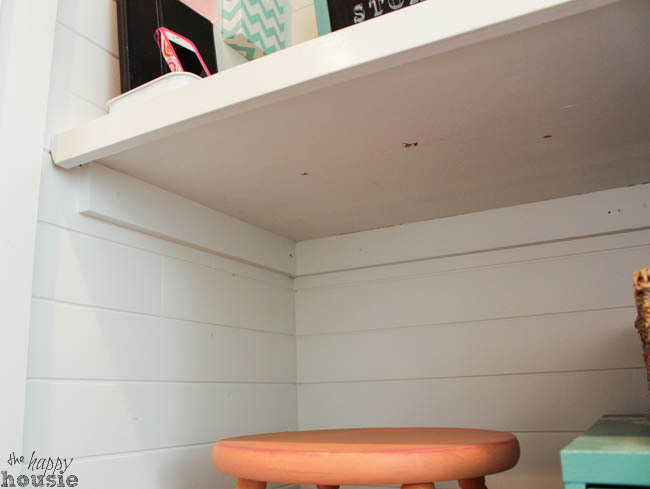 You have everything a large space would include in such a pretty, well organized, compact use of space. Love it! Beautiful! I love everything you did to the closet. 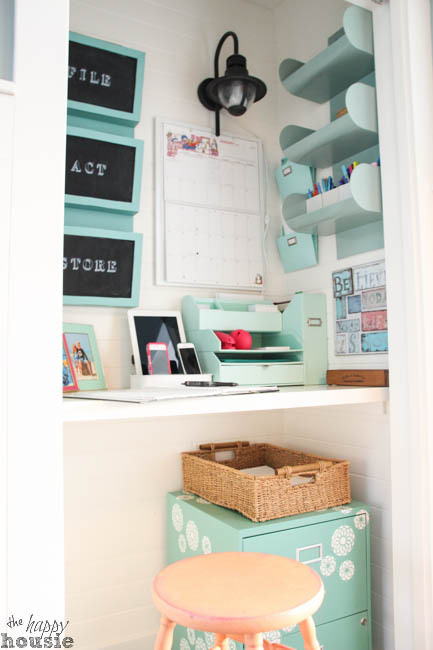 I am fortunate to have a spare room for my office, but I will be incorporating several ideas you shared. Thanks so much for sharing with all of us. I look forward to your wiring post! So pretty…of course! I am in love with these Martha Stewart office products and the orange stool. I am definitely in full organization mode. Thanks for the inspiration. Wow, Krista! 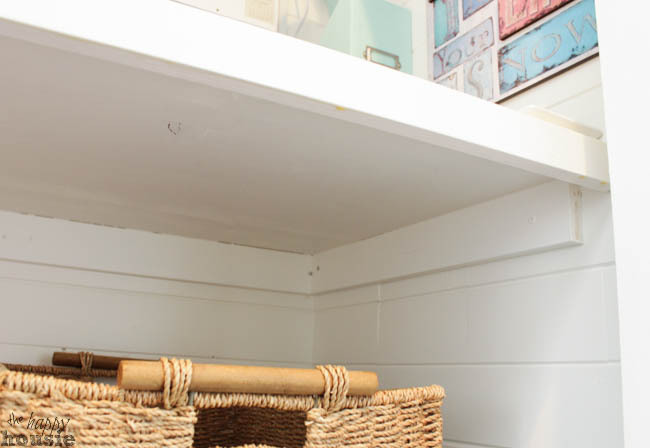 You transformed that closet into such a functional space! 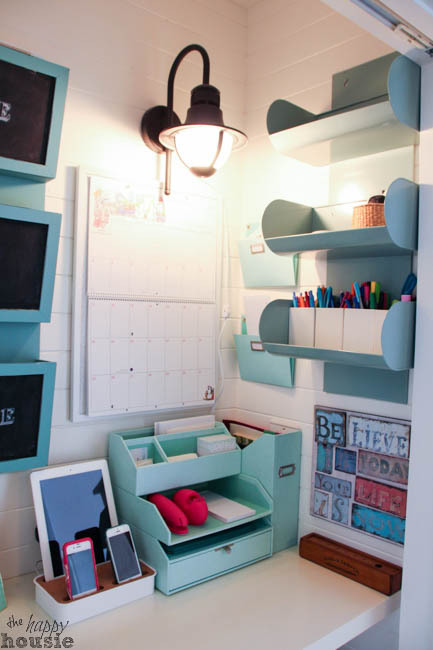 Love how organized it is and everything has it’s place!! How sweet! I wish I had an unused closet now! 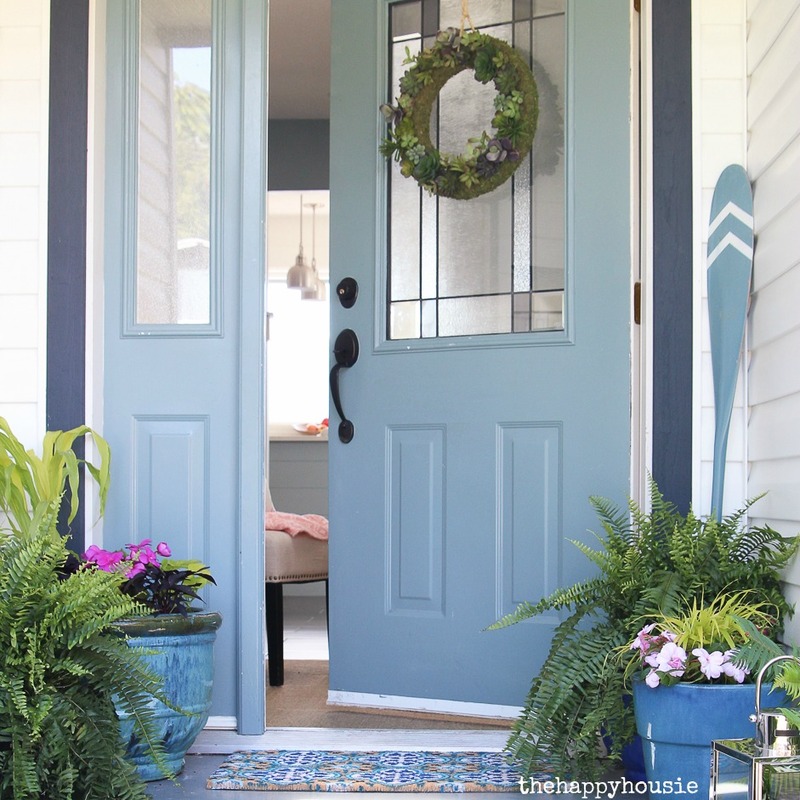 Love the colors you’ve used and the tongue and groove siding, the light, and all the cute organizing things! 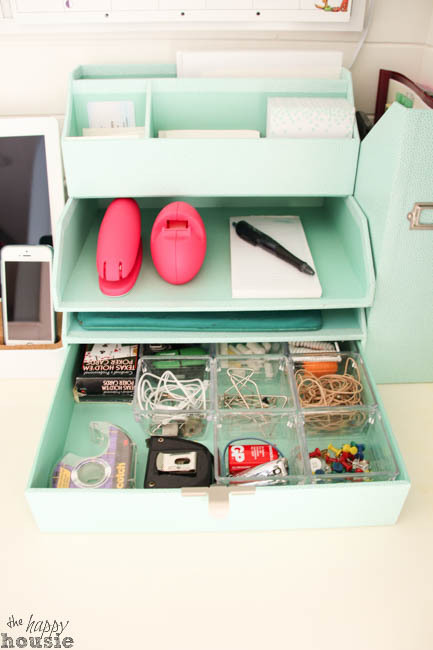 This is SO cute and functional, Krista! I love that you took the time to add the paneling, paint everything, add a light fixture…all those details make this tiny space completely amazing!